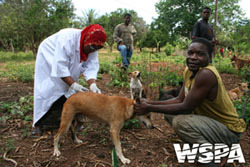 Once the first objective of the dog rabies control project has been achieved (i.e. elimination of dog rabies from a given area), efforts should be made to keep this area free from rabies (maintenance phase). It is recommended that the OIE and WHO guidelines be consulted for definitions of rabies-free countries and regions, available here and here. Please note that the OIE definition of rabies free areas is valid only for import regulations and is not intended to guide post-exposure prophylaxis and other public health decisions. A region or country is recognized as free from dog rabies only if adequate epidemiological vigilance and surveillance do not detect any animals or people infected with dog rabies viruses for a period of two years. Adequate surveillance includes, but is not limited to, submitting all suspect animals to laboratory diagnosis, as described here. The minimum requirements for adequate rabies surveillance are detailed in the Rabies Surveillance Blueprint, Section 3. The maintenance of an area free from dog rabies requires effective import and quarantine regulations as they are defined by international bodies, as explained here. A risk assessment taking into account the presence of wildlife rabies (including bat rabies), the prevalence of dog rabies in neighbouring areas, the effectiveness of import regulations and the quality of surveillance will inform decisions on the necessity of maintaining high vaccination coverage in dogs once the region is dog rabies free. For example, continued dog vaccination in transport hubs and border areas to ensure buffer zones may be necessary in the initial stages of the maintenance phase, while maintaining intensive surveillance and implementing prompt response strategies (i.e. containment vaccination) following new introductions. The export of dog rabies control efforts to neighbouring jurisdictions should be attempted through increased cross-border collaborations involving relevant ministries and agencies and may be supported with resources as they become available. For example in KwaZulu-Natal, a rabies across borders group, comprising representatives from neighbouring territories (Mozambique, Swaziland and Mpumalanga), has been formed as part of a national canine rabies control programme. previous page: 5.4.16. What dog population management tools are currently recommended? next page: 5.4.18. How can we monitor dog movements?